Predominant Motif: 2 alphabets: both missing J and U, one ampersand. Numbers 1-24 done three times. Various cross bands and simple stitched lines. Linen thread is worked in buttonhole and hem stitch and cut and drawn work with needle lace filling stitches and hollie point. A complete band of cutwork is worked just above the joints of the lower section, which comprises two narrow vertical strips of linen to either side and one along the bottom, forming a frame for the panel of needle lace and hollie point. 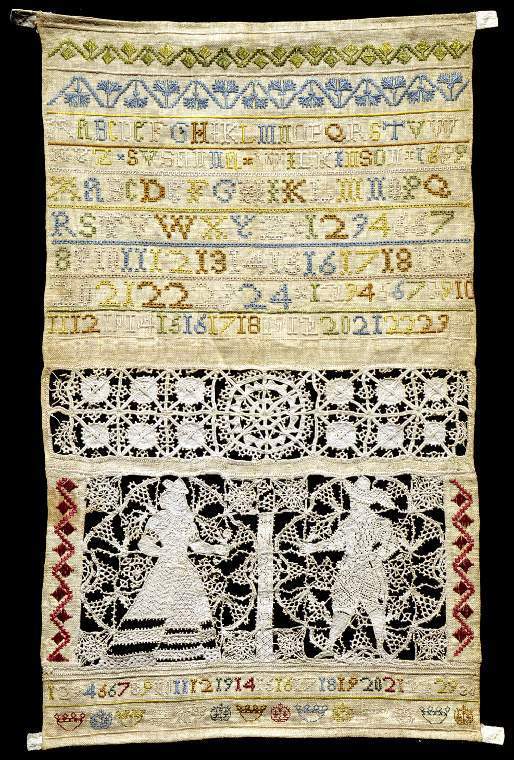 The figurative panel of a male and female is not totally dependent on a cutwork grid; part is worked as freely made needle lace (punto in aria) and then inserted into the sampler. The two figures are divided by a band of hollie point inscribed '17 SW 00'. Numbers and coronets fill the final two bands of the sampler with a small repeat pattern worked vertically either side of the pictorial panel.